How was your Thanksgiving? Mine was good… Surrounded by loved ones, delicious food and sweet-tooth satisfying desserts. 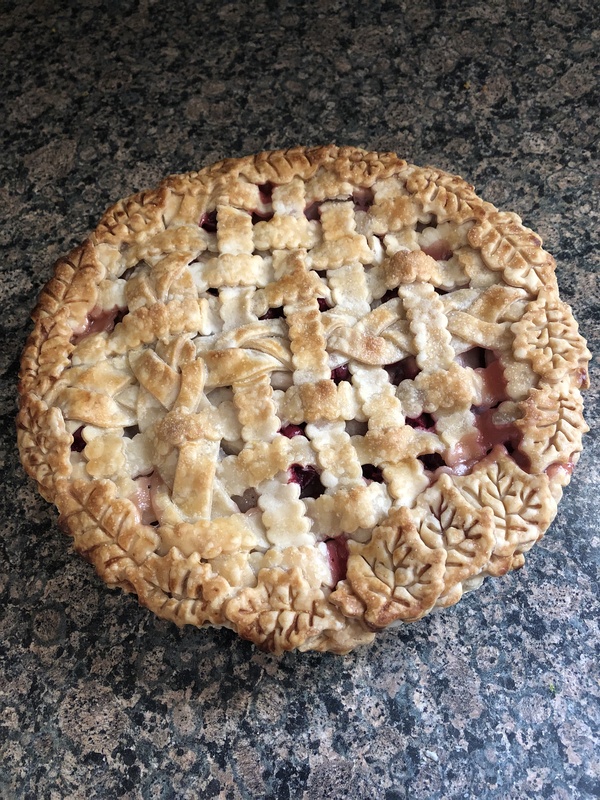 Of course, I did my fair share of baking… Key Lime Pie, Pumpkin-Brownie Swirl Pie, Pumpkin Pie, a Pumpkin Tiramisu Cake and the below Pear Cranberry Pie, just to name a few things. I’ll admit that I took some major shortcuts when it came to making the crust for this pie. 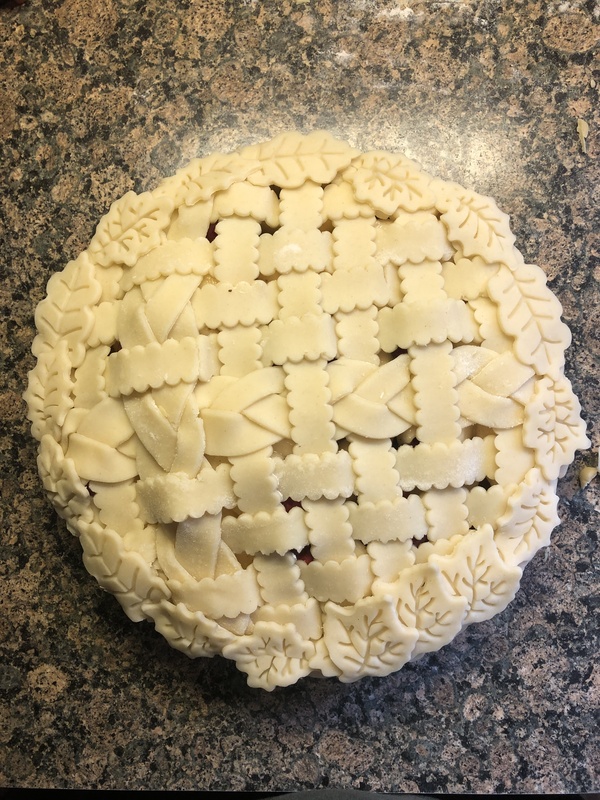 First off, I used a frozen deep dish pie crust as the base and for the lattice pattern I used refrigerated pie crust that I cut into strips to weave and braid and then added a decorative border with leaf cut-outs. I decided to brush the pie with milk prior to baking – I usually use an egg, but, after all of the baking I did I was feeling lazy and didn’t feel like cracking and whisking an egg – so I made sure to dab a little milk under the leaf border so to that the leaves and the lattice and braided strips would adhere to the crust. One other thing to note, I let the frozen crust sit out at room temperature for a few minutes after filling it so that it would be easier for my top crust stick to it. As for the filling, if you’ve never had pear pie you should definitely try one. For me, pear pie isn’t as sweet as apple pie and while I do bake a lot I actually don’t like things that are overly sweet. If you want the best of both worlds, try this Brown Butter & Vanilla Pear Pie I made last year for Thanksgiving. While the filling consists mainly of pears, there is 1 apple in the mix. As for the recipe for this or, I got it from the premiere issues of Magnolia Journal last year. You can find the recipe here. Now that Thanksgiving is over I am looking forward to Christmas and New Year’s. I can’t believe how quickly the year has flown by. Fourth of July honestly feels like it was just a few short weeks ago, but, it was more like 5 long months ago. Today marks my three-month anniversary at my new job, oh yeah, I never mentioned that, I got a new job. I was working part-time before but I am now working full-time, which has given me some challenges when it comes to writing blog posts and sometimes baking, but, not really. I can always squeeze in some time for baking. Next week I will be bringing you my 3rd annual Cookie Palooza… Hopefully you’ll try at least one of the recipes and just maybe it will become one of your staples. One of the cookies is actually one I am planning on making and gifting later this month, oops, later next month – we are still in November. I kind of like that Thanksgiving was early this year. I feel like it cuts down on the panic of realizing that the next set of holidays are just around the corner. Although, I was at Walmart a few weeks ago and seeing people shopping for what seemed like Christmas gifts already had me panicking a bit. Like I was short on time to get things done. Yikes! I have to-do lists everywhere I look. The second week in December I am bringing you something new… A Holiday Cake Week. The idea came about last year when I never seemed to get the time to post about a Yule Log Cake I made and then some Snickerdoodle Cupcakes I made. So, I figured I would save the write-up for both and create a special week for them this year. Rounding out the five is a Pull-Apart Cupcake Christmas Wreath, a Rum Cake and a Rainbow Cookie Cake. Yum! So, sit back, enjoy this last month of the year and don’t forget to indulge in some delicious treats. ‘Tis the season! « Promote your blog here; Blog Party #3! !